A quick note about a hard drive: I just replaced the internal hard drive on my 15" MacBook Pro (model A1211) using the procedure at iFixit.com. So far, I'm thrilled with the new drive, a 2.5" 500GB, 7200 rpm, Hitachi Travelstar 7K500 SATA drive with 16MB Cache (Model number HTS725050A9A364). The performance is noticeably quicker than the 5400 rpm model that had been in the laptop, and, icing on the cake, it's very quiet, too. I could just barely hear it over the laptop fan noise when the drive was doing sustained writes. Highly recommended. I bought it from Other World Computing, which bundled the drive with a simple toolkit (Torx T6, Torx T8, Phillips #00, and 1.8 mm Flat screwdrivers, and a nylon spudger) and a USB 2.0 external SATA drive enclosure for approximately $125. Altogether, not a bad day in the workshop. Why do this? It's a great way to boost the performance of these old machines at relatively low cost, particularly if you only have 256 MB of RAM. (I only paid around $30 for a 1 GB RAM module made by Samsung.) 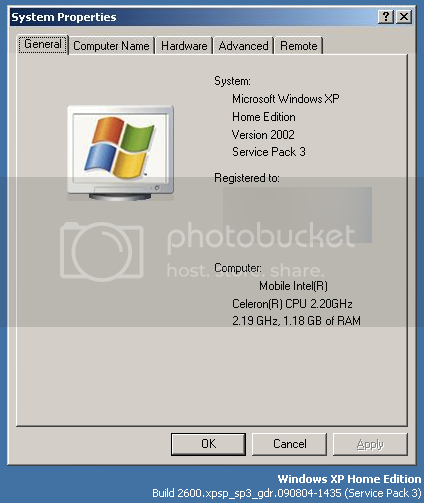 Having over a gigabyte of RAM makes it feasible to run things like Microsoft Office 2007, or even...Windows 7. Stay tuned! PS. I'm by no means the first person to upgrade an Inspiron 1000 with a 1 GB module, but there continue to be fairly strident statements from some sources that 512 MB is the absolute maximum amount of RAM that can be seen in these machines (the 256 MB that are soldered into the machine and an additional 256 MB via an expansion slot). Unless there is some rare motherboard variant for which this would be true, it's just not so. Way back in July 2004, before the era of $300 netbooks, I saw a deal (via DealNews.com, if I remember correctly) that was almost too good to be true: a new Dell laptop for around $800. It was no speed demon, but it seemed like it would be a solid machine for those occasions when I needed to run Windows software at home. My Inspiron 1000 shipped with a 2.2 GHz Mobile Celeron Intel cpu, a 30 GB hard drive running at 4200 RPM, a 24X CD-RW/DVD Combo Drive, 256 MB of RAM soldered to the motherboard, a 14.1 inch screen, Windows XP Home Edition, and the WordPerfect Office Suite. The deal also included a Dell TrueMobile 1300 802.11b/g wireless PCMCIA card. I admit to having a love/hate relationship with this machine. While it was inexpensive and built like a tank, it was also disappointingly slow, even for a "budget" laptop, particularly after installing anti-virus and anti-malware software. Also on the negative side of the ledger, its battery was anemic, at best. However, the Inspiron 1000 does have one very important characteristic: it is very easy to open the machine to upgrade things like RAM or hard drives. Within four months of buying the laptop, I spent $50 to add another 256 MB to the machine, bringing it to the maximum 512 MB of RAM officially supported by Dell in this model. This upgrade had a noticeable impact on the machine's performance, yielding a much snappier user experience. Unfortunately, over time, system performance seemed gradually started to feel slower and slower, something not unheard of with Windows XP. I did try some alternative operating systems, including flavors of Linux like Ubuntu, CentOS, SUSE, and Knoppix, and I also gave OpenBSD a try. Each of the alternatives had something I liked, usually having to do with web performance or the absence of a constantly running virus scan, but none worked as well as XP with some of my peripherals, so I kept going back to XP. Fast forward to November 2007. I was upgrading the RAM and the hard drive on my workhorse machine, a 12" 1.5 GHz Apple PowerBook G4, when I noticed that it used the same type of RAM (200 pin PC2700 DDR SO-DIMM) and hard drive (2.5" ATA) that the old Inspiron 1000 used. I decided to see if the 100 GB hard drive (running at 5400 RPM) and the 512 MB RAM module that I pulled out of the PowerBook might give the Inspiron a new lease on life. First I upgraded the RAM, even though 512 MB modules were not officially supported by Dell. I had to remove the 256 MB module I bought in 2007 in order to add the 512 MB module, but the machine recognized all of the new memory, yielding a total of 704 MB usable memory (256 MB soldered RAM + 512 MB upgrade - 64 MB RAM allocated to the video subsystem). The system was paging to disk less often and felt subjectively faster, so this upgrade was a "win," even if it wasn't as dramatic an improvement as was obtained from the original November 2004 RAM upgrade. The big win came when I upgraded the drive. Replacing the original 4200 RPM drive with a 5400 RPM drive (a Seagate ST9100823A) gave a dramatic performance improvement. The Inspiron felt like a whole new machine! I generally only use my Inspiron as the front-end to my scanner, to run OCR software, and to update the software on devices like my GPS system. Since the rest of my network is fairly secure, and I generally don't do much web browsing on the Inspiron, skipping the anti-virus/anti-malware software and running the computer as a non-administrative user has been working well, while allowing me to devote cpu cycles to my work, rather than to security software. I don't recommend this approach for everyone, particularly if the computer is used by others, particularly children, or if "risky" web browsing is a common pursuit, but it may be worth investigating further. In my next post, I'll talk about adding a 1 GB RAM module to my Inspiron 1000, taking it a full 768 MB beyond its official RAM limit. That will also set the stage for the craziest thing I've tried to do to this machine yet: install Windows 7 Professional on it. VERY STRONGLY RECOMMENDED: If the machine doesn't already have at least 512 MB of RAM (which would show up as 448 MB under system properties, since 64 MB of the 512 MB is devoted to shared video RAM), ignore the official Dell specs and the various online configuration tools at places like Crucial.com, and immediately add either a 512 MB or 1 GB RAM module to your Inspiron. As of this writing, 512 MB 200 pin PC2700 333 MHz DDR SO-DIMMS are selling for $15-30 from reputable online sources, and 1 GB modules are selling for $30-60. CONSIDER: Avoiding the overuse of anti-virus/anti-malware software if your computing habits and environment are relatively safe and secure.